The Sea of Thieves Beta has come and gone, I was lucky enough to be a part of it and I have to say that my experience with it as a whole was a very positive one. During the Beta players were only given access to one of the three main factions – the Gold Hoarders who will mainly want you to hunt down Treasure chests in return for a cut of the gold. The main game will also have the Merchant Alliance who will ask you to run supplies, deliver live stock or resources. Finally there is the Order of Souls who will want to collect Magical Artifacts. 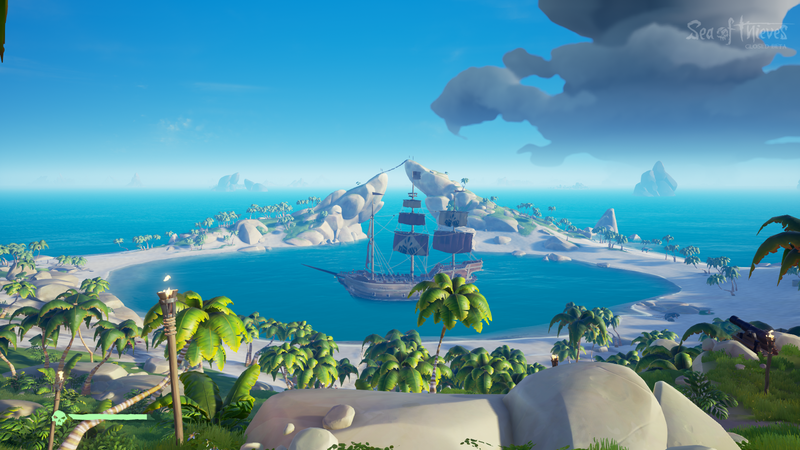 I played through a number of Voyages for the Gold Hoarders both as a solo player and as part of a four man crew. Some of the Voyages will have you deciphering riddles – although they’re pretty straight forward, and others will just give you an island map with an X marked where the treasure is. When I first jumped in to play, I went solo. You spawn in randomly on an island with your ship anchored up nearby. For the solo players, you’re given a fairly small Sloop. It’s easy to manage on your own with access to the anchor and ropes for sail length and direction by the Helm – on the Quarter Deck. This makes moving between them to navigate a lot easier. You can also peer over the back of the Quarter Deck to get a view of your map below, so if you set it up correctly before you set off on a journey you don’t really have any need to head down below to check on where you’re going. The Sloop is only fitted with two cannons – one on each side, so it does make it a little light in the fire power department, but what you lack in fire power you make up for with maneuverability. For the most part I spent my solo time carrying out Voyages and exploring islands. I have to say that I absolutely love the look and feel of the game, it has a great charm to it, the cartoony visual style is great, the sea effects are amazing and all the sound design is top notch – the creaking of your ship is awesome. 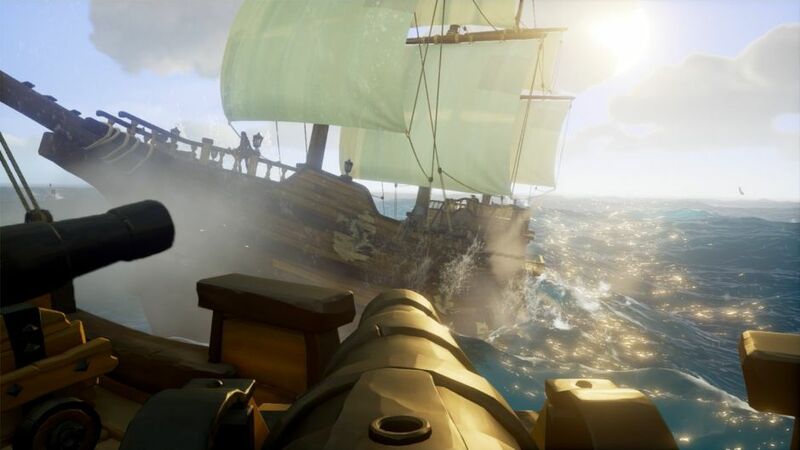 I eventually engaged in a bit of PVP action as I spotted a Galleon anchored up, it was a lot of fun, but a little tricky trying to take on so many guns, whilst also trying to manoeuvre and get a good position. You can watch my attempts at taking on a Galleon below. Co-op play is probably the main draw for this game though, jumping in and playing with some friends is going to be where you will have the most fun. I randomly joined a crew of three others and we manned a Galleon for a good hour or two and had a very successful time of treasure hunting. Even though two of our group weren’t using microphones it was never really much of an issue, we were still able to communicate well enough through the in game voice lines. Controlling the Galleon takes a lot more coordination as it has three large sails, a much bigger, slower heavier anchor (best to use three to raise it quickly). When sailing, the helmsman will rarely have a good view of what’s ahead due to the sails so communication from a lookout will be needed. There are also eight cannons on the ship and three decks to manage, so it would be wise to try and assign some roles to players. Overall I probably played Sea of Thieves for around 7 hours and I enjoyed every aspect of it. It’s going very much for a more casual, user friendly approach to the mechanics and combat which makes it a lot of fun and very accessible. I do however have some issues with the game. The main one is longevity and its price. Sea of Thieves is being marketed as a full price game at £50 and I’ve yet to see what justifies that price tag. Granted the Beta is very much not the final product and we will be seeing a lot more customisation for both characters and ships, plus the additional factions for missions. But Rare really need to give us some more details about what we can expect in the final product, and I think now is the perfect time for them to do that. They have a lot of people who’ve really enjoyed the Beta and want more, so give them some concrete details! Will there be any end game kind of activities we can get involved in? Or will it just be missions for the factions and PVP. Speculation is getting wild and Rare need to get a hold on it because it will get out of control and people will just end up completely underwhelmed. On the bright side though, Microsoft have announced that Sea of Thieves will be included as part of the Xbox Game Pass meaning you’ll be able to play it through subscription to that – which what I, and my friends will be doing. I’m really excited for the release of Sea of Thieves, it has a lot of promise and I really hope it can live up to it. The game sounds promising, but will it have enough content for the players to keep on playing without getting to repetitive? You can’t answer that but it is one thing what keeps me away from getting it haha. I think it will all depend on what they reveal before it releases. There is a great core game there just needs to make sure it has enough to keep people interested for long enough. Exactly. Well I am curious for sure. This is my question also! The game looks great from what I’ve seen though. Pleased to hear that it seems positive so far, I’ve been curious say how much content there will be in this game since it’s announcement. I really hope there is enough to keep me playing for a good chunk of time. But Yea, so far so good!